i can’t help it. anytime i think nachos, i think bad jokes. it’s like the two are inextricably connected in my brain. crazy. speaking of crazy, you want to hear something crazy? crazy is that my roommate “doesn’t really like snacks.” as in, she’s not a grazer. she doesn’t open the fridge and stand there thinking, “i need a lil’ somethin’ somethin’.” EVER. this blows my mind. i am a huge snacker. i overpack my lunch every day just in case i need a string cheese at 3PM or some popcorn at 4. at night, i crunch rainbow-colored NERDS on my couch while i watch house hunters, and sometimes, i stuff my face with trader joe’s cheesy popcorn. hi my name is sarah and i can’t live without snacks. so it’s totally baffling to me that a person could say something like, “i don’t really snack.” SAY WHAAA, GIRL? but you know what, you guys? i made her snack last night. yes indeedy i did. and it was all thanks to the magical power of these nachos – which, by the way, take less than five minutes to throw together and require NO MEASURING CUPS OR SPOON AT ALL. easiest “recipe” ever. ready for the hard part? spread your chips out on a plate. then sprinkle with cheese. you want the cheese to be the bottom layer so that it melts straight onto the chips. YUM CHEESE. next sprinkle your beans and corn on, then top with salsa, and if you’re a cheese-a-holic like i am, MORE CHEESE. now, microwave for a minute or two. GIRL, you have just made some seriously kickass nachos. optional other add ons, if you’ve got ’em: chopped cilantro (I HAD THIS WHY DID I NOT USE IT?! ), chopped avocado/guacamole, a sprinkle of fresh lime juice, chopped chicken or beef. 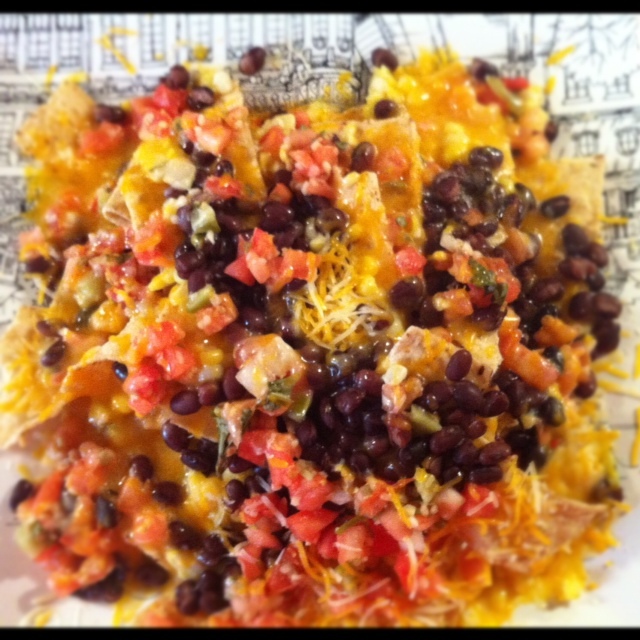 nachos are like a garbage can that tastes really good. you can put ANYTHING on there, and as long as you add cheese and melt that ish, you’re guaranteed a party in your mouth.